ADVANCE DOG TRAINING E-COLLAR SYSTEM Low to high power. Rheostat dial allows for gradual increases in stimulation intensity with no jumps between levels (0-127). Has a 3/4-mile range. Stimulation type- Nick, constant and nonstimulating pager/vibration. Uses a new Lithium Polymer battery that provides a 2-hour rapid charge. 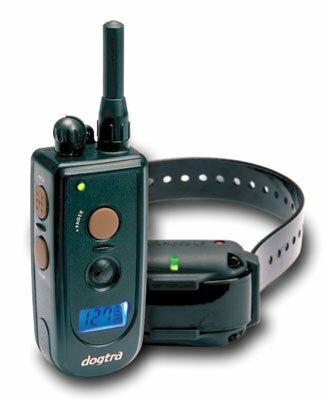 Fully Waterproof collar/receiver and transmitter. One charger system allows the transmitter and receiver to be charged at the same time. Over 8000 different identity codes to prevent signal match-up with other e-collars. Easily visible blue LCD screen displays exact level of stimulation and can be seen in the dark or low light conditions. Three bar battery life indicator and LED colored indicator to show remaining battery life.